After a bit of agonizing, and a few semesters’ experience, I have come to believe that global identity is broadly ideational. It can be enacted locally, and students can form global identities through building stronger connections to the places they live. 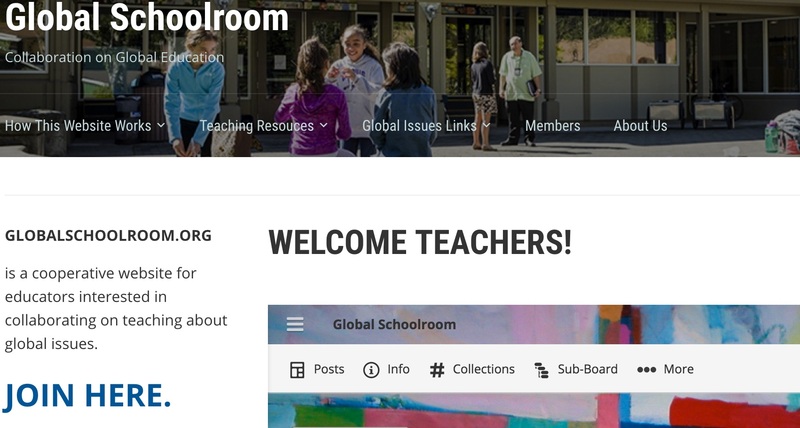 Here, divided into two posts, are four project/assignment ideas for building students’ sense of global interconnectedness and responsibility. Of course, global citizenship education is accomplished by reaching across the globe and acting globally as well. This is what my students did early last term when they traded thoughts on global identity with students from New Zealand, Mexico, Hong Kong, and New Jersey in the US, using the application Flipgrid. But at the same time, a global consciousness is more truly realized in daily decisions and actions. Here are two units/assignments that taught my students a lot, made them soberly aware of the scale of these problems, but ultimately offered a sense of empowerment and connection. 1. A report recommending more just and sustainable sources for school T-shirts. Now I know this is an American thing: we have T-shirts made for everything! Homecoming football games, Mock Trial clubs, robotics teams, you name it. Additionally, our school sells hundreds of pieces of branded clothing each year. My students learned about the controversies surrounding outsourcing and the labor conditions in many parts of the garment industry (including the 2013 Rana Plaza collapse which killed 1,134 people) as part of a unit on economic globalization. Then I broke the students into groups. Some looked at the social and environmental impact of typical t-shirts; another group studied the companies that manufacture and print our school’s branded clothes; others came up with three new recommended providers, based on labor record, environmental sustainability as well as price; a few students decided to write a section on simply lowering our collective consumption of T-shirts; and a small group wrote a brief section with final recommendations. Our Administration has looked at the report I don’t know what will happen, but my students could potentially steer a lot of business away from less ethical companies; they could also help support a small, woman-owned company that uses natural dyes. We’ll see. We began our unit on climate change by spending two days each on the current environmental aspects, then the political and policy situation, and finally two days on the current economics of climate change. I have included links to most of our readings at the bottom of this post. We then briefly turned to Paul Hawken’s book, Drawdown, so they could get a sense of what is being done, and just how much hope remains for slowing the impacts of climate change. I asked them to each pick one of Hawken’s 100 “solutions” and research it. When they shared what they had learned in groups of four I could feel the mood lifting in the room. Still, it’s disingenuous to give students the sense that they are “solving” climate change. Yet any unit on such a pressing problem really needs to give students space for action, or at least self-expression. So I gave them a long list of choices: they could enter an essay contest 350.org was running, continue research on Drawdown, research and lobby on a climate-related bill at the state level, look into what a local, small city which is home to Nike’s headquarters is doing to fight climate change, and so on. Having a choice about what to look into, and how to present the information the put together, makes a difference in terms of student buy-in. One student had already wrestled with questions of where best to attack the problem of climate change as well as with our feelings of individual helplessness. In response to these emotions, he offered a fine brief paper on what people can do on their own to combat climate change. He wasn’t tasked with finding the three most efficient strategies and this was a blessing, I think. His paper focused on the less obvious actions, including reducing food waste, adopting a vegetarian diet, and disposing of old refrigerators responsibly (this last topic comes from Drawdown and is #1 on Hawken’s list). Two students interviewed one of the plaintiffs in Juliana v. United States, the so-called “climate kids” case and created a terrific podcast (which, sadly, I cannot upload to this version of WordPress). Another made a beautiful pamphlet, “Climate Change in the Kitchen,” that I wish could be given out free at kitchen stores. Other topics included an examination of GHG emitted by the global shipping industry and how they might be lessened; a review of the current state of household solar energy in the US; and an examination of the relationship between birth rates, women’s income, and GHG emissions in Nigeria. What I liked about these two assignments is that they made my students feel connected to the broader world in a specific sense. Especially with our T-shirt project, they also felt that their work might actually have impact. Below are fairly up-to-date links to good reading on climate change. Politics/Policy 1: 350.org, “Do the Math — the Movie,” 2015; David Victor, “Why Paris Worked: A Different Approach to Climate Diplomacy,” Yale Environment 360, 15 December 2015; Michael Le Page, “Paris climate deal is agreed – but is it really good enough?” New Scientist, 12 December 2015; Ann Berwick “The Paris deal is not enough, and time is running out,” Boston Globe, 30 December 2016; Jamie Condliffe, “The Paris Climate Pact Is in Effect, but It’s Not Enough,” MIT Technology Review, 4 November 2016. Politics/Policy 2: https://www.whitehouse.gov/energy/climate-change; UN Framework on Climate Change, “Developments in the United States, By Executive Secretary Patricia Espinosa,” 31 March 2017; Coral Davenport, “Trump Lays Plans to Reverse Obama’s Climate Change Legacy,” New York Times, 21 March 2017; Michael Bloomberg, “Climate Progress, With or Without Trump,” New York Times, 31 March 2017. Economics 1: Dr. Chris Hope, “How Large is the Bill for Global Climate Change?” 2016. Lecture begins at 3:30, ends at 50:25 or so. THIS IS A KEY TEXT. Economics 2: David Suzuki and Ian Hanington, Just Cool It! : A Post-Paris Agreement Game Plan (Vancouver, BC: Greystone, 2017), 93-101 (pdf); “Carbon Tax or Cap-and-Trade?” David Suzuki Foundation, http://www.davidsuzuki.org/issues/climate-change/science/climate-solutions/carbon-tax-or-cap-and-trade/. Since your students were looking at T-shirts, they hopefully discovered that cotton is one of the ‘dirtiest’ crops in the world—only organically-grown cotton is truly ethical. But ethical sourcing also should include Fair Trade, not just the absence of gross exploitation — did they get into this? In food products, coffee is the best-known FairTrade product—because it’s the 2nd-most-heavily traded commodity in the world—but Fair Trade is also vitally important in chocolate, to prevent the exploitation & slave labor that characterizes many cacao operations. * Being the Change: Live Well and Spark a Climate Revolution, by Peter Kalmus. New Society Publishers, 2017. * Up-to-date Keeling Curve – Atmospheric concentrations of CO2 continue to climb, so don’t forget to use the updated curve published by Scripps Oceanographic Institute. As of December 30: 407.35 ppm. A new animated version is also available at the same site. * ‘Does Climate Change Have A Place In The English Classroom?’ in Council Chronicle, published by National Council of Teachers of English (December 2017). This article is also available on the authors’ website. * English Teachers Concerned about Climate Change blog. Recent posts include ‘Climate Change and the Imagination’, ‘Climate Change and Critical Media Literacy’, and ‘Studying Censorship of Language Related to Climate Change’.